In My Stratum-1 Desk Clock and My Stratum-0 Atomic Clock I described the two clocks that I built: O-1 a.k.a. "Hourglass", and O-2 a.k.a. "Astrolabe". Both act as stratum-1 NTP servers on my home network, along with two commercial units, "Waterclock" and "Sundial", that I have previously described. I mounted both clocks on inexpensive acrylic fixtures from office supply stores that just happened to be about the right size and shape to serve as stands to display my handiwork. Hourglass is my desk clock sitting on a shelf in my home office. It is a Raspberry Pi 3 using Raspbian and runs the GPS daemon and the NTP daemon. It connects to my home network wirelessly, although the wirefull port works as well. It uses the NMEA output and 1PPS strobe from a Uputronics GPS board to discipline its system clock. It has a real-time clock board that with the push of a button can save the time to a battery-backed clock to preserve its state should it need to be powered off. Thanks to the standard Linux kernel and GNU software, it automatically adjusts to Daylight Saving Time, and GPS itself automatically adjusts to the occasional leap second. As long as it can receive GPS signals from an amplified antenna sitting in my office window, it will be within milliseconds (at least) of Universal Coordinated Time. Astrolabe sits on a small table in the living room. 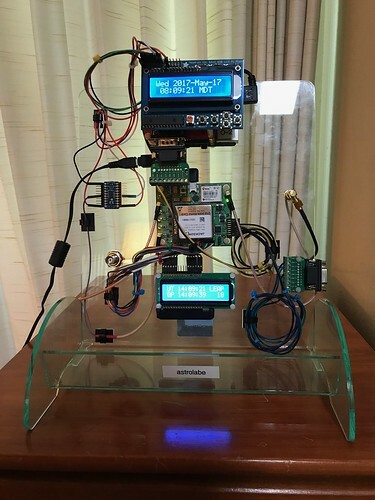 It is virtually identical to Hourglass in both hardware and software, but replaces the Uputronics GPS board with a Jackson Labs Technologies CSAC GPSDO, a board that has a Microsemi Chip-Scale Atomic Clock that it phase locks to GPS time. Astrolabe receives NMEA output from the GPS chip on the GPSDO board, but gets its 1PPS strobe from the CSAC cesium-133 oscillator. 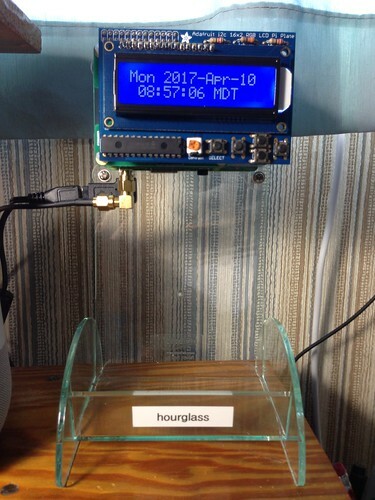 Once the CSAC is initially disciplined to the GPS 1PPS, and the Pi's system clock is disciplined to both GPS and 1PPS, even if it subsequently cannot receive GPS signals from the matchbook-sized amplified antenna sitting in the living room window, it will still be within milliseconds or even microseconds of UTC. Astrolabe also includes a couple of test points: a BNC connector to the 10 MHz output of the CSAC, and an RS-232 serial port to the command interface of the GPSDO. This is the most accurate and precise timepiece I will ever own, perhaps could ever own, my own stratum-0 atomic clock. Far far better clocks exist, but I am unlikely to ever own them, much less have them in my living room. Its time is traceable to the atomic clocks in the U.S. NAVSTAR GPS satellite constellation in orbit, which are traceable to the U.S. Air Force Master Control Station clock in Colorado Springs Colorado, which is traceable to the Washington Master Clock at the U.S. Naval Observatory in Washington D.C., which is traceable to the NIST-F2 clock at NIST in Boulder Colorado, which is synchronized with atomic clocks all over the world coordinated by the International Bureau of Weights and Measures in Paris. I have been fascinated by time, time measurement, and time keeping, for decades. Having spent the past forty-plus years working on real-time systems close to bare metal, this was perhaps inevitable. The ability for information to cross the boundary between the real world and the digital world fundamentally depends on the quality of our frequency sources. And our interpretation of reality rests on the accuracy and precision of our clocks.